The fluorescence kinetics of both intact needles and isolated chloroplasts of summer active and winter stressed Pinus sylvestris were measured at both room temperature and 77 K. It was confirmed that winter stress inhibited the photochemical capacity of photosystem II but also that winter stress caused the strongest inhibition of the electron transport at the site where the plastoquinone pool is reduced. 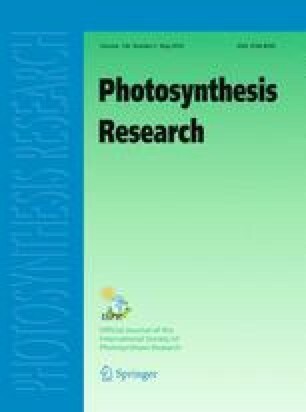 Parallel analyses of the fluorescence characteristics of photosystem II (F693) and photosystem I (F729) during photosystem II trap closure furthermore revealed that the yield of spillover of excitation energy from photosystem II to photosystem I decreased upon winter stress. We suggest that this is because of an increased radiationless decay of excitation energy both at the reaction center and antennae levels of photosystem II. There is, however, also a possibility that the decreased yield of spill-over is accentuated by a partial detachment of the light harvesting chlorophyll a/b complex from photosystem II upon winter stress. Paper presented at the FESPP meeting in Strasbourg (1984).